Join Art Battle London and London Drawing for a new explosion of creativity in The Vaults subterranean tunnels under Waterloo Station. Vote for your favourite artist as we whittle 10 down to one winner while Art Battle and London Drawing collide to create art as spectator sport in one of the most exciting spaces in London. 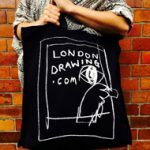 London Drawing will create epic performance art, sound and light installations for the Art Battle competitors to respond to in a thrilling fusion of art, performance, fashion and music. Would you like to compete in Art Battle IV? Could you be one of our competitiors? Know someone who would relish the challenge? We would love to hear from you! On 18 November at 7pm The Vaults in Waterloo will host the forth Art Battle London. This unique social art event has been gathering a cult following in Manchester over the last three years. The premise is that 10 artists have 30 minutes to paint, draw and create on a blank A3 canvas in two rounds, the audience are given tokens when they enter and vote on the rounds resulting in an Art Battle Champion – the atmosphere is clubby, yet relaxed and very supportive. It is being touted as the most inclusive arts event ever, ‘art by the people for the people’. The art on the night gets auctioned off in a silent auction with money split between the artist and a local charity. It is an event that has to be attended to really understand the atmosphere – like an open mic night for artists, but more fun.